We have indexed 3,787 marriages that were registered at St Michael & All Angels Church between 1561 and 1950, and these are available to search in our Archives. Inspired by June A. Fancett of Victoria, Australia and her work over many years in transcribing the original documents from microfiche, we have taken this forward by indexing these transcriptions and others for the Internet. We thank Gill Tarry and Cathy Goodwin for their work on this project. “This marriage was not solemnized because Henry SEERS the father of Mary SEERS forbade it, stating upon his oath that his daughter was under age and came to the church at Marden this day June 13th 1847 signed J Deeds vicar of Marden”. The path of true love never did run smooth! You can search the marriage index for either the grooms’s surname or the bride’s surname. If you find the person you are looking for, we may be able to supply you with further details of the wedding. You may find that the grooms’s surname and/or the bride’s surname is followed by a X. This means that person was unable to sign their name but had made their mark instead. 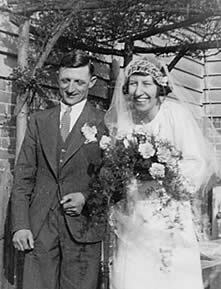 If you would like to know more about marriage ceremonies in the past, follow this link to England and Wales Marriage Certificate Information.